Headphones Specifications Explained — What Does it All Mean? / Headphones Specifications Explained – What Does it All Mean? Headphones Specifications Explained – What Does it All Mean? You’re browsing store shelves or looking online, and you see a list of specs for each of the headphones you are looking at. You frown and wonder what it all means and why it is even important, and there is no need to be ashamed, we have all been there plenty of times before. It can be frustrating and really annoying not knowing what it all means, so we are here to take some of the pressure off. In this guide, we look at each of the specifications and take you through exactly what they mean so that you can make the right choice for you. What are the Different Specifications? Before we get into the details, this section will take things slow and start introducing you to the concept of headphone specifications in a way that won’t cause too much worry when you look at all the new terms. If you are searching for the one spec that will make your music sound good and wondering why all of these matters, be patient and head over to the next section. You see, the specs all work together to create the perfect listening experience, and one that will make your music sound absolutely spectacular. All will be revealed below. What Does Each Specification Mean? Now, we are going to go through each of the specs in more detail to give you a better understanding of the effect they can have on the overall listening experience. In simple terms, this is a magnet, some voice coils, and a diaphragm that works by taking the electrical signal from your device and turning it into a sound that can be picked up by your ears. They come in a number of different sizes and styles, but the larger drivers tend to mean that more power can be pushed through them. They will also provide you with better bass at low frequencies, but the sound can also start to break down at higher ones – so size is not everything. The three main types of driver are dynamic (big and loud), balanced (found in in-ear headphones), and planar magnetic (a combination of the first two). This is not a particularly important spec in terms of music quality, but it is still good to know what it is and what it does. It works by taking the electrical signal created by your CD or music player and converting it into a sound wave that can be picked up by your ears. This is the range at which your headphones can produce sound, and is a good one to familiarise yourself with, and they run a wide frequency spectrum that works a lot like the speakers in your car. You have the big speakers for bass, medium ones for mid-range sound, and small ones for the treble. Think of this, but combined into one speaker and you have headphones. The full range starts from 5Hz and goes up to 40,000Hz, but most headphones try to stick within a 20-20,000Hz range. This is because not every human is able to detect sounds below and above those figures. When you buy headphones, you may not see the hertz range, but Db plus/minus instead, and all this means is how close the sound is to an accurate reproduction – the closer to zero, the better. This is another term you need to be familiar with when buying headphones, and when you see this rating being listed it will be the Greek symbol for Omega, also referred to as ohms. It will be expressed as a rating between 2ohms and around 600ohms, which tells you how high you need to turn the volume up in order to get to a good listening level. Do note that many of the headphones with higher impedance will require a headphone amp to get to full power. This is all about efficiency, and shows how good the headphones are at converting the electrical signal from your CD or phone into an undistorted sound wave. You will find the sensitivity rating is listed in decibels (dB), and most headphones will sit within the 85-105db range. Anything over 110db can cause severe damage to your ears in a very short space of time, so be responsible. Headphones with low sensitivity need more power from the device to give you that high-quality sound, but they will last longer than their high sensitivity counterparts most of the time. This is linked in with sensitivity and refers to the maximum decibel level that the headphones are able to output. When you see this rating, it will be displayed as the following: dB SPL/mW, dB/mW. This isn’t something you need to be an expert on, but it is good to know a lot about it as well. Both your device and headphones will have different levels of THD, and may even measure them differently as well. What THD does is refer to the comparison of signals from the input of your device before being turned into a percentage – with the perfect score being zero. THD is actually barely noticeable to the human ear, especially when you consider that even noise cancelling headphones don’t score that perfect zero. This refers to the size of the power output that the headphones are able to support, and are shown in the form of kilowatts or mW. There are some companies that do not list this information on the packaging, but you should have no problem finding them on the manufacturer’s website or the user manual. The headphones you buy should have a MIP that is close to the source (your phone, for example) because a wattage that is higher than the headphones could end up damaging them. This is defined as the loss of energy from sound waves, because as they travel, they are reduced, and so it is good to find materials that are able to cancel noise out and ensure that only the music reaches your ear. Foam and cotton are the most commonly used materials, and the former is arguably the best for really cutting out the ambience. Just as a side note, it is good to also take the different types of headphones into consideration as well – each of which has guides and articles dedicated to them on our site. Here’s a little look at the types of headphones available, as well as some of their key features. These completely cover the ears for a fully immersive experience and clear sound. Big and bulky, but also very comfortable to wear for long periods of time. These rest on the ears so that you can pay attention to your surroundings while listening to music. Comfortable to wear, they are also much easier to pack away and very light. These are different to earbuds because they rest inside the ear canal and are also made to fit snugly inside the ear. They are comfy, and the size can be changed easily. Plus, the audio quality tends to be excellent. 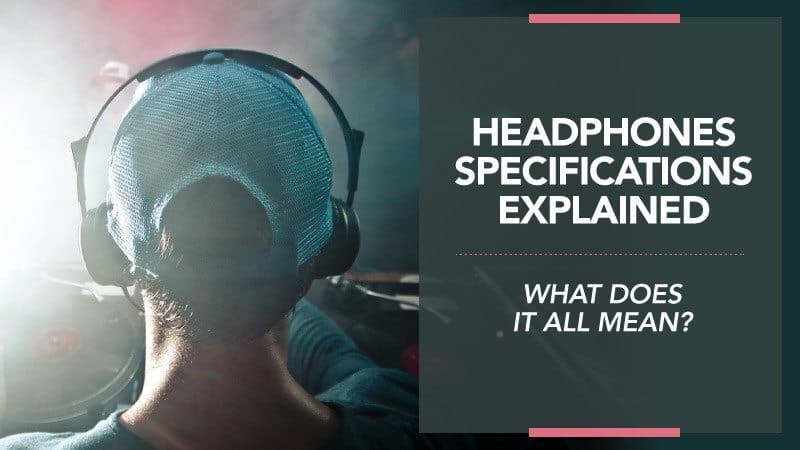 We hope that this guide has been helpful to you when understanding the different specifications for headphones and what they mean. We want you to find the perfect pair, and knowing what to look for is one of the most important parts of the process. We know that you will find something that takes your breath away from the moment you plug them in, and we would love it if you let us know if this guide was helpful to you. Leave us a message in the comments below with your thoughts.